In a country where survivors of acid attacks dare not show their faces in public, photographer Rahul Saharan shot a series of fashion portraits of women who had been disfigured. Ritu (pictured) was just 17 when she was attacked. The clothes were designed by Rupa (R), 22, who survived an acid attack when she was 15. Ritu (L) and Laxmi live in Chavvn, one of the few shelters for acid attack survivors in India. "When you see these pictures, you feel in love with them," said Saharan. "You want to look at them again and again." Ritu lost vision in her left eye 15 days after she was attacked. Chanchal, along with her sister Sonam, were attacked after they protested when a group of boys were teasing them. "Your soul has to be good the face does not matter," says Ritu. Sonam and her sister Chanchal were sleeping when acid was thrown over them. 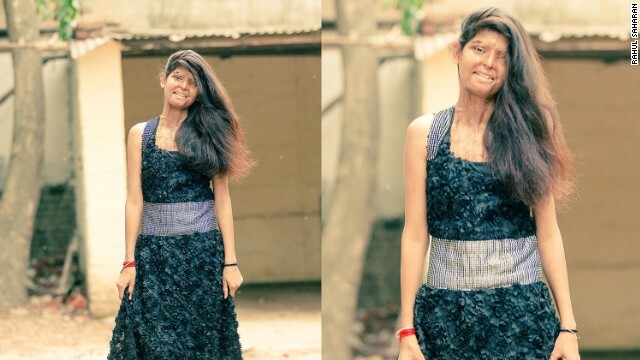 Laxmi wants other acid attack survivors to come out of isolation. New Delhi (CNN) -- It was a photo shoot that caught India's attention. 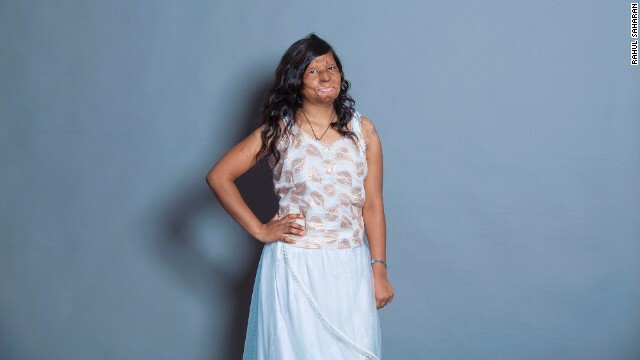 Five courageous survivors of acid attacks posed for portraits. In a country where victims of such attacks do not dare to come out of hiding, or show their disfigured faces in public, this was a "ground breaking" photo shoot, participants said. "After the acid attack I never took photos," Rupa, one of the models and a survivor said. "When the photos got circulated in the media, people started calling to inquire about me, I felt so good. After the photo shoot I want to go out meet more people." Rupa, now 22, was 15 years old when she was attacked by her stepmother following a dispute about money. "That night, after acid was poured on my face, I could not see anything. I could not open my eyes, I was screaming," she said. "But no one came to help me. My stepmother watched me suffering." After that night, everything changed. "My studies stopped, I stopped playing." It was only three years after the acid attack that Rupa gathered enough courage to look at her face in the mirror. It was her childhood dream, to be a designer and Rupa designed the outfits for all the models featured on the photo shoot including herself. The photos were first published on Facebook page run by Stop Acid Attacks, an organization raising awareness about the plight of acid attack victims but have since been featured extensively across the world. Her next step is to open a boutique. Currently she is living in Chhanv, a rehabilitation center for acid attack victims opened by the charity. In 2013, the Indian Supreme Court passed laws aiming to control over-the-counter sales of acid. But the implementation has been poor though, said Alok Dixit, founder of Stop Acid Attacks. "Yes, the law is on paper, but you can find acid easily in local markets," he said. "We need the government to be active in enforcing the law to regulate acid sales." According to the group, more than 200 acid attack cases have been reported since January 2013. But activists including Alok believe the real number is much higher. Lacking support from family and society, many victims do not report attacks to the police. Fearing social stigma, many do not even show their face in public. And that is what the group wanted the photo shoot to change. "We want the acid attack survivors to come out of hiding and tell their stories. It is okay to show your face," Alok said. Rahul Saharan, a professional photographer, was the man behind the camera. He wanted to showcase Rupa's designs and help her motivate other fellow acid attack survivors across the world. His second goal: make the victims feel beautiful and change the way people define "beauty" in general. "In our society, there are lots of things said to the girls -- you are not beautiful, you won't get married because your skin is not white and fair," Rahul said. "I want to change the perception of beauty -- tell people that the real beauty is not about having a fair skin. "When you see pictures used in commercials, you just see and forget them after sometime, but when you see these pictures, you feel in love with them. You want to look at them again and again." 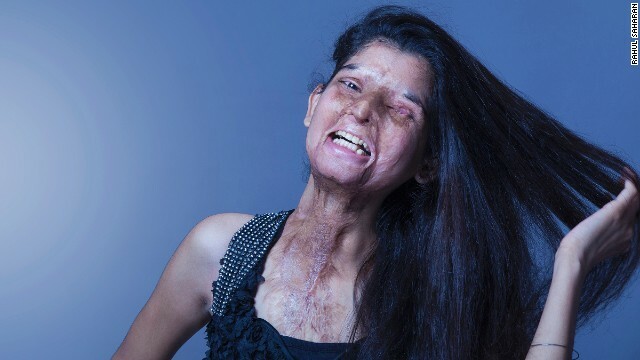 Ritu, another acid attack victim and a participant of the photo shoot, was 17 when acid was thrown at her face. She is 19 now and going through treatment. She cannot see with her left eye. "Every acid attack survivor says they do not want to meet the attackers," she said. "But I want to meet the guy (who did this to me) and ask: 'was it worth it?'" Omar Khan and Sumnima Udas contributed to this report.